Some application installers add items to your Library folder that you may not want to have, and there is the possibility that someone could try to trick you into installing something you would rather not have on your computer. With a little help from Mac OS X Folder Actions, you can take a proactive approach to defending your system and files. Let's add a folder action to your StartupItems directory, so we'll know if any application installers add anything that will launch automatically when your Mac is turned on. - Launch Folder Actions Setup. It's in Applications > AppleScript > Folder Actions Setup. - Click the Enable Folder Actions check box. - Quit Folder Actions Setup. Make sure Folder Actions are enabled. - Navigate to your StartupItems folder. It's in the Library folder on your hard drive. 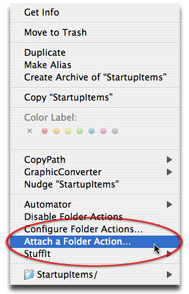 - Control-Click (Right-Click on a two button mouse) the StartupItems folder and select Attach a Folder Action. - Select add - new item alert.scpt (The script should be at the top of the list. ), and click the Choose button. Use the StartupItem's contextual menu to add a folder Action. Any time an item is added to your StartupItems folder, you'll see an alert dialog that can open the folder and highlight any new items. 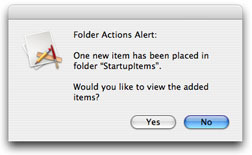 The Folder Action Alert dialog. Feel free to monitor other folders, too. If your Library folder has an InputManagers folder, that's a good one to attach this Folder Action to. Check the Library folder that's in your Home Directory. If you have an InputManagers folder there, be sure to attach this action to it as well.